I think they really suit her! Finally we have one of my newest additions, the $10 budget frankie on an articulated body. This is actually one of my first redresses and I'm pretty proud of it. I still think she needs a bit more red on her lower half. Maybe if I paint her shoes I'll add some red accents. Her shoes and accessories are amazing imo, some of my favorites in a while. Oh Apple looks so cute in Rosabella's glasses! They absolutely suit her. It always disappointed me a little that none of her dolls ever came with cute glasses even though the character wears glasses (we got that Dexter ripoff pair in the fainting couch, but that was it). Your decision to put Rosabella's glasses on her is so perfect! Thank you very much SaelaVe! I agree about Apple's glasses, I always hoped that Rosabella BEAUTY getting introduced with glasses would lead to Apple realizing she can still be the fairest with them on, but that plot thread just dropped off. I felt like sharing today so here's a terrible group shot of my most recent purchases. Finally, my Heartstruck Cupid. Dosneko gave me the idea to give her a milkmaid braid here but it didn't really pan out when I tried it. The braids were really thick and I couldn't get it to look good in the back, so I just gave her a messy bun. I might try again eventually but for now I think she's lovely. I recently learned the wonders of decent lighting and the crop feature on my phone so here's a pic of Party Ghouls Abbey I took for a review I'm working on that probably won't get used. I think I need a light box but my homemade background+desk light combo turned out okay. I was going to post this in the 'what changes have you made to your dolls' thread but I w/e here's good. My new School Spirit Apple and her new hair. 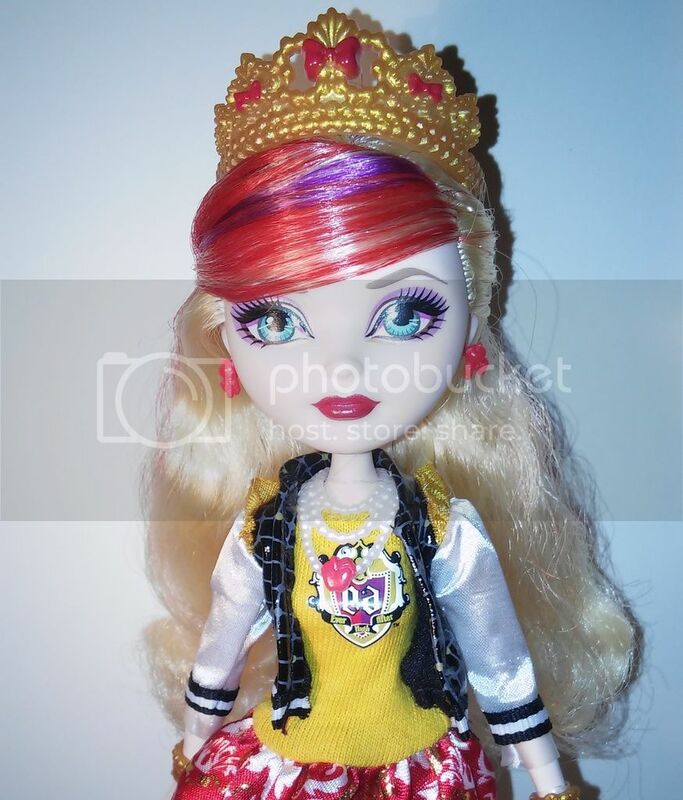 I love the School Spirit 2-pack, Apple especially, but her stock hairstyle made her face seem really awkward and ovaloid. I saw someone on instagram give her side bangs and she looked amazing so I followed suit! Funnily enough now she and Raven kind of match. Those look excellent, ReversedUser! I especially love the pic of Abbey. I think I need a light box but my homemade background+desk light combo turned out okay. Something that I do to cheat ('cause I don't have softboxes or proper photography equipment at all) is I tape a piece of plain white paper over my light. It acts as a great diffuser to soften the light. This works better with LED bulbs so that you don't run the risk of igniting the paper with a hot lightbulb. Lots of photos today! I got really inspired for Valentine's Day so I took a BUNCH of photos for EAH and MH. You'll never guess who learned how to edit photos on her computer (it's me). I got so much mileage out of Heartstruck Cupid's bouquet you have no idea. Let's start off with EAH! Y'know what's interesting? Darling has no gold anywhere on her person other than that heart on her headpiece. Who does she end up waking with True Love's Kiss? A girl with entirely gold accents and jewelry. Funny that. Raven/Maddie is one of my more lowkey ships. I can see it both romantic and platonic. I kind of have a weakness for falling in love with your bff and I love how Maddie was the only one who knew who Raven really was for a long time :'). Dexven is the ship that keeps on sailing. I liked it, then I disliked it, then I went back to liking it. Do you ever wonder what Rosabella being the daughter of a beast means for her? I do. A lot. I like to think Briar and Faybelle's relationship is 85% snark and attitude. This was going to be sig Briar but then I realized the blue in SU's hair was super close to Faybelle's blue so yeah. Farrah canonically has issues with feeling unappreciated and Crystal spends nearly the entirety of part 2 showering her with praise. Plus they both have wands and nonhuman skin tones. This ship sails itself. Would you believe I shipped Hunter/Ashlynn/Farrah even before we got that bio info about her crush on Hunter? I think Bunnistair is cute. Listen. Poly!Wonderlandians are my jam. If I had a Courtly she'd be here too. Of course V-Day isn't just about romance! It can be about your family too! Now, let's take a trip to Monster High and see how they're celebrating! Turns out taking a picture of Clawd and Draculaura doesn't work if you don't have a Clawd in your collection. Shocking I know, so you get Frankilaura instead. The one. The only. The OT3. Monster High's #1 power couple doing what they do best: Being better than U.
Gigi hasn't gotten much development since her NS diary so finding out she's a little competitive from Finnegan was kind of amazing. I like them together aesthetically at least. Gil and Lagoona really got the short end of stick where their relationship is involved. If they end up being canon again I really hope someone in the writer's room leaves the saltwater/freshwater dealio in the dust. Would you believe I liked Clawdeen/Viperine before the Scare & Makeup 2pack? Another low-key ship but good nonetheless. I freaking love that french figurine booklet that showed Nefera and Clawdia have school together and Nef totally slacks. Before this pic I never noticed what good contrast these two have. Howleen has her hair down and is wearing a skirt, Twyla has her hair up and is wearing pants/a jumper. Bracelet and cup placement is mirrored. Neat. Gigi and Iris are so vibrant next to each other it's kind of insane. This pic does not do them justice. A family affair - Monster High style! Really wishing I had gotten Scarnival Clawd when I had the chance. Sometimes even the siblings you don't get along with need love. Or maybe this is just 'tolerance'. I figured taking a picture of Deuce and Posea would be in bad taste all things considered so I decided to invoke percy jackson logic that Poseidon is the father of all the cyclopes, which makes Posea Iris's...half sister? Great Aunt? Who knows. Being separated from your fam can be hard, but Gigi and Whisp are managing. They made sure to call each other so they know they're loved. Even though they aren't technically related, Frankie and Robecca consider themselves 'sisters' of sorts and decided to hang out after Frankie's date with the twins. You can also celebrate your friends! Loads of fantastic pics! And such a variety of couples / groups too! It must have taken you ages to do them all. What a great photospam! You have me intrigued with Rosabella/Cerise now too (especially since my Bella is wearing Cerise's cape) and I love Gigi and Whisp monster-skypeing! Ohhhhhhh So many pics! Now that is what I call a photospam! Thank you for sharing! I'm glad you're all enjoying the photos! I had a lot of fun taking them all even if it took some time. Since I wanted make sure all my V-Day photos got posted the day of I decided not to post my MM related stuff but I can do that now! They actually got here on Monday, which is amazing considering the estimated delivery time was the 23rd! I'm so happy with them! As you could see in the Valentine's Extravaganza I did some modifying to suit my tastes. Clawdeen was flawless per the usual, but I wanted more blue. 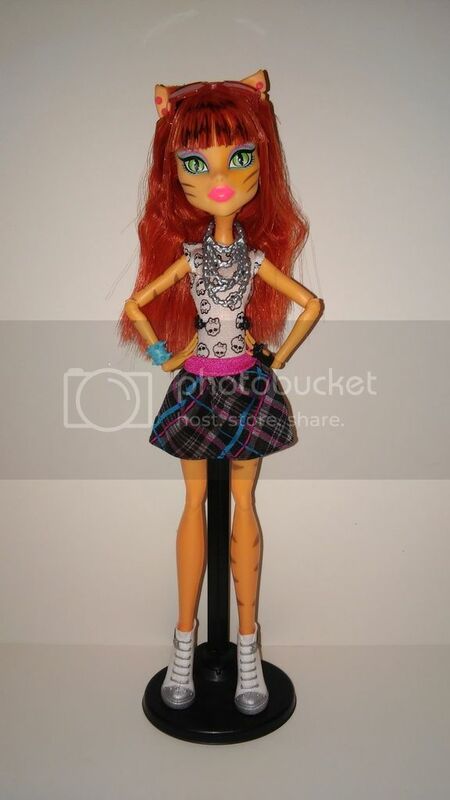 We never get Clawdeen in blue anymore. Gigi's maxidress is quite possibly the best piece of clothing MH has ever given us. I love it. Lala looks fabulous! I really like the blue eye shadow on her. Ohhh! I love all your additions to the Maul Monsteristas! I love Draculaura in the outfit she comes in, but she looks absolutely stellar in Iris's clothes! I never would have thought to try them on her. And the accessories you gave to Gigi really pull her look together. Man I've been out of lately. At least I have photos to share! 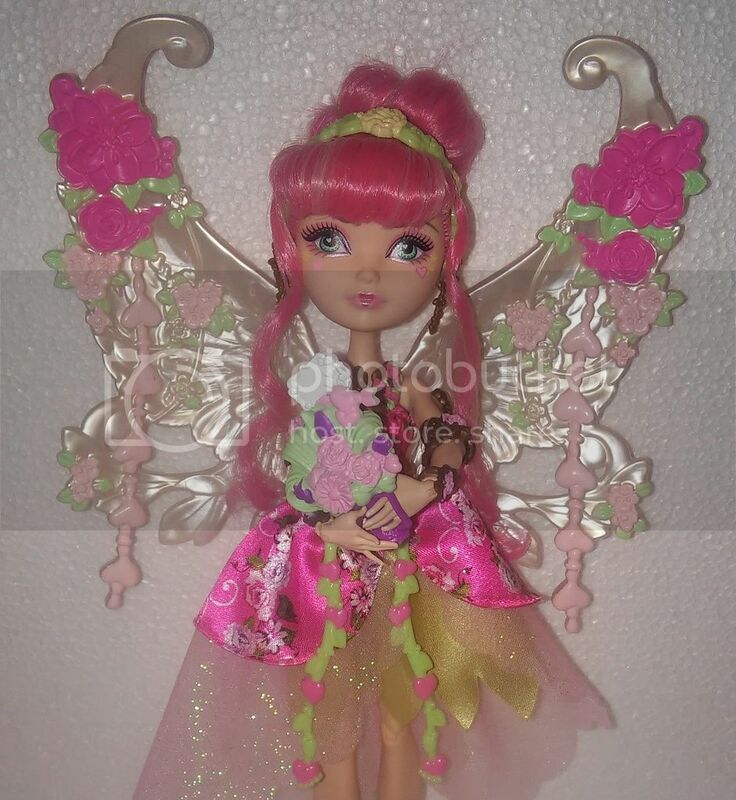 I totally missed out on the Fierce Rockers 2pack, so GS Toralei is back to being my one and only. I put her in Frankie's FP (with some modifications) and I think she rocks it! Her makeup really helps.